Sri Ramakrishna, (1836-1886) was a Bengali mystic who had a huge impact on the development of modern Hinduism. 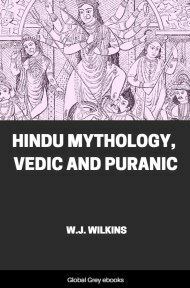 His chief disciple, Swami Vivekananda, not only helped revive Hinduism in India, but also introduced Hinduism to the West. Ramakrishna was a non-dualist worshipper of the Goddess Kali. However, he also experimented with Christianity and Islam, and repeatedly preached the diversity of paths to God. 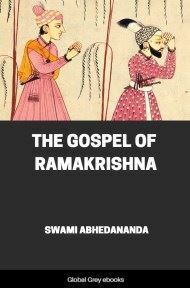 This is the story of Ramakrishna told first-hand as a series of days and nights spent with his disciples and lay followers. Imagine someone following Buddha or Jesus around with a steno pad and then publishing candid transcripts of their notes. This is the Victorian-era equivalent. We watch Ramakrishna go into his trances, sing devotional songs, and dispense parables. We get to listen into his profound discourses, including lucid descriptions of very high-level yogic techniques. This is a unique look at a holy man. Bhagavân Srî Râmakrishna lived for many years in Râni Râshmoni's celebrated Temple garden on the eastern bank of the Ganges in the village of Dakshineswara about four miles north of Calcutta. This Temple with the garden attached was dedicated by its foundress (Râni Râshmoni) to the Divine Mother (Kâli). In the northwest corner of the spacious Temple-compound is a small room which faces on the west the waters of the sacred river Ganges. This room with its holy surroundings was consecrated as the dwelling-place for many years of Bhagavân Srî Râmakrishna, whose Divine Presence made the spot holier and more sacred. It was from this retired corner that the rays of His Divine glory, emanating from His God-intoxicated soul, dazzled the eyes of the seekers after Truth and attracted them to Him as a blazing fire attracts moths from all quarters. Hundreds of educated men and women were drawn towards this superhuman personality to listen with the deepest reverence to the words of wisdom uttered by One who had realized God and who lived in constant communion with the Divine Mother of the universe. Mahendra's visit to the Temple. One Sunday in the month of March, 1882, Mahendra, hearing from a friend about this Divine Man, was so deeply impressed that he came to the Temple garden to pay Him a respectful visit. It was the day of a special religious festival and people had gathered in great numbers in Srî Râmakrishna's room and on the veranda. The Bhagavân was seated on a raised platform, and on the floor around Him were Kedâr, Suresh, Râm, Manmohan, Bijoy, and many other devotees. They gazed up into His radiant face and drank the nectar of the living words of Divine wisdom that fell from His hallowed lips. With a smiling face Srî Râmakrishna was speaking to them of the power of the Lord's Holy Name and true Bhakti as the means of attaining God-vision. Addressing Bijoy, He asked: What do you say is the means of attaining to God? Power of the Lord's Holy Name. Bijoy: Bhagavan, by the repetition of His Holy Name. In this age the Holy Name of the Lord has saving powers. Bhagavân: Yes, the Holy Name has saving powers, but there must be earnest longing with it. Without earnest longing of the heart no one can see God by mere repetition of His Name. One may repeat His Name, but if one's mind be attached to lust and wealth, that will not help much. When a man is bitten by a scorpion or a tarantula, mere repetition of a mantram will not do; a special remedy is necessary. Bijoy: If that be the case, Bhagavan, then how did Ajâmila, who was the greatest of sinners and committed all sorts of crimes, obtain salvation by repeating the Name of the Lord at the time of his death? Râmakrishna: Perhaps in his previous incarnations Ajâmila was righteous and performed a great many good deeds. Besides, it is said that he practised asceticism later in this life. It may also be said that at the last moment of his life the repetition of the Holy Name purified his heart and therefore he attained salvation. When an elephant is washed, immediately he throws dust and dirt over himself; but if he is kept in a clean stall after his bath, then he cannot cover himself with dirt. By the power of the Holy Name a man may be purified, but he may once more commit sinful acts because his mind is weak. He cannot promise that he will never sin again. The water of the Ganges may wash away past sins, but there is a saying that sins perch on the top of trees. When a man comes out of the Ganges and stands under a tree, the sins drop over his shoulders and seize upon him; these old sins ride him, as it were. Therefore, repeat the Holy Name of the Lord, but at the same time pray to Him that you may have true love and devotion for Him, and that your love for wealth, fame and the pleasures of the body may decrease because they are transitory, they last only until to-morrow. All religions lead to God. When there is true devotion and love, one can reach God by any of the sectarian religions. The Vaishnavas, the worshippers of Krishna, will attain God in the same way as the Sâktas, the worshippers of the Divine Mother or the followers of Vedânta. Those who belong to the Brâhmo-Samâj,the Mahometans and Christians, will also realize God through their respective religions. If you follow any of these paths with intense devotion, you will reach Him. If there be any mistake in the path chosen, He will correct the mistake in the long run. The man who wishes to see Jagannâth may go towards the South instead of towards the North, but some one will sooner or later direct him in the right way and he will surely visit Jagannâth in the end. The one thing necessary for realization is whole-hearted and whole-souled devotion to God.